"All we have is our stories, all we have are our memories and we are hoping that it’s enough," said one asylum seeker. 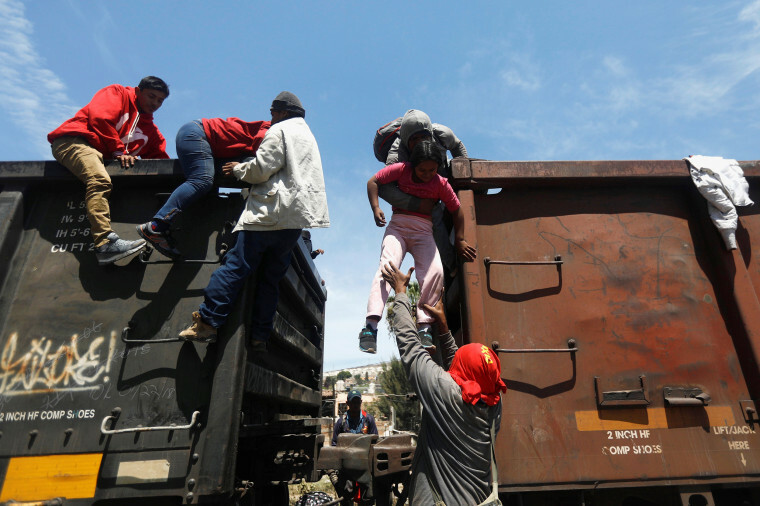 TIJUANA, Mexico — Hundreds of Central American migrants traveling through Mexico in a caravan began arriving in the border city Tuesday, with many still intent on seeking asylum despite fresh threats of prosecution and deportation from the Trump administration. Numerous tents were set up at the Movimiento Juventud 2000 shelter in Tijuana, just south of California, to house the migrants — who have said they are fleeing violence and persecution in their home countries — before they attempt to surrender at the U.S. Port of Entry. About 300 migrants are expected to sleep in the shelter before taking the last step of attempting to cross the border and possibly request asylum. It's the largest number of migrants taking part in the caravan to reach the border — about 50 members arrived late last week, Reuters reported. María, a 17-year-old from Honduras who arrived Monday with her one-year-old son, José Roberto, sought asylum at the U.S. border immediately. She was turned away, she said, and plans to try again. She told NBC News on Tuesday that she traveled with few belongings: a small backpack that had only a couple of diapers for José, a few changes of clothes for herself and a comb for her hair. "This is all I have," she said on her belongings. José's shoes sat in a corner of the shelter as he ran around barefoot among the brightly colored tents set up for the rest of the families from the caravan. María said she left Honduras after José's father threatened to kill her. Earlier this week, the Trump administration revved up its warnings of deportation and possible prosecution, saying it would send additional resources to the border in order to ensure that all caravan asylum cases were "adjudicated promptly." Department of Homeland Security Secretary Kirstjen Nielsen, acting under orders from President Donald Trump, said the agency was monitoring the group's movement and those who enter the U.S. illegally will be referred for prosecution. Nielsen said asylum seekers will be detained while their cases are processed, and those who the U.S. determines don't have a legitimate claim will be "promptly removed from the United States." Attorney General Jeff Sessions also excoriated the caravan, saying the effort was a "deliberate attempt to undermine our laws and overwhelm our system." On Monday, María said, she and José sat at the pedestrian U.S. Port of Entry for over ten hours. They walked there from the shelter and arrived at 6 a.m.
"It was so hot," María recalled. Just past 5 p.m., María said, an agent walked out and told everyone that they would only be accepting Mexican citizens seeking asylum that day, so she returned to the shelter. The journey was organized by Pueblo Sin Fronteras, a Central American and Mexican-based group. It has been operating caravans for over 15 years to help people escape violence in their home countries and shield them as they travel. Sitting nearby María was the Flores family. They started out with the caravan but broke off after their family sent them money to pay for bus tickets to Tijuana. The family is made up of two sisters, Maritza and Edith, and Maritza's three children and partner. Fighting back tears, Edith told NBC News they left their home in El Salvador and fled to Guatemala after MS-13 gang members threatened violence and death if the men in their family didn’t join the gang. But members of the MS-13 followed the family to Guatemala and continued to threaten them, they said. The family was waiting for the rest of the caravan to arrive at the shelter, hoping they would fare better at the border as part of a larger group. Maritza brought her daughters’ birth certificates and passports to show border agents, but is still worried her family doesn't have enough proof to show in order to eventually be granted asylum. “All we have is our stories, all we have are our memories and we are hoping that it’s enough,” Maritza said. Mariana Atencio and Annie Rose Ramos reported from Tijuana, with Dartunorro Clark reporting from New York.